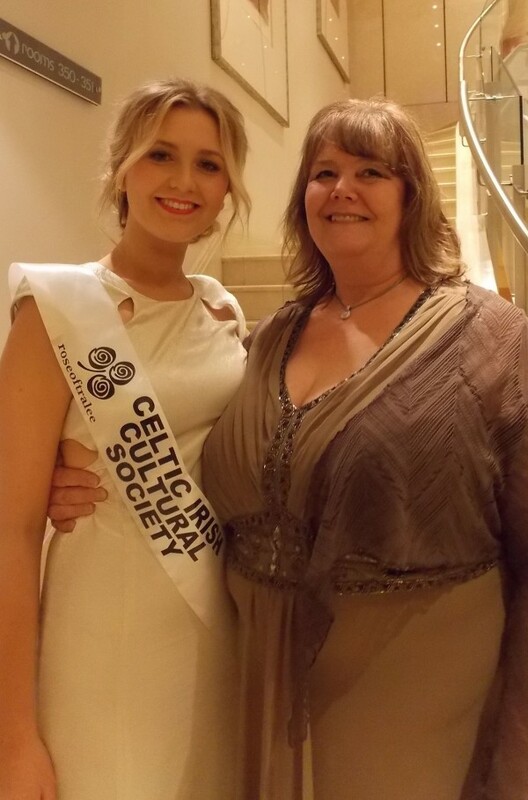 The night of 12th April – or the early morning of the 13th – was a time of celebrations as Crawley’s Grace Kenny with roots in Tullow, Co Carlow and sponsored by the Celtic and Irish Cultural Society was crowned London Rose of Tralee 2013. Sean Moriarty of the Irish World covered the event and we thank him for allowing his piece to be posted here………. A former Britain’s Got Talent contestant has been named as the 2013 London Rose. Grace Kenny from Crawley, Sussex and a political student at Portsmouth University, is a member of the Celtic Coleens Irish dance troupe that made it to the semi-finals of the popular television series two years ago. The 21-year-old was selected from 13 other hopefuls from at the annual London Rose of Tralee selection ball at the Crown Moran Hotel in Cricklewood on Friday night. Grace, whose late father Martin hails from Tullow in County Carlow and whose mother, Ronnie, is from Kent, represented the Celtic and Irish Cultural Society, on the night. She wowed the judges with her Irish dancing and clearly demonstrated why she finished eighth in the world championships in Dusseldorf, Germany, a few years ago. She also impressed the 250-strong audience with her stories of world travel and helping the less well off in Nepal and why she believes that politics is not boring and her ambitions to make it interesting to younger people. Grace was in a state of shock when her name was called out by chairman of the organising committee, Noel O’Sullivan. Her mother, Ronnie (Veronica) was amongst the 30 strong group of supporters that travelled from Crawley to London for the big occasion. 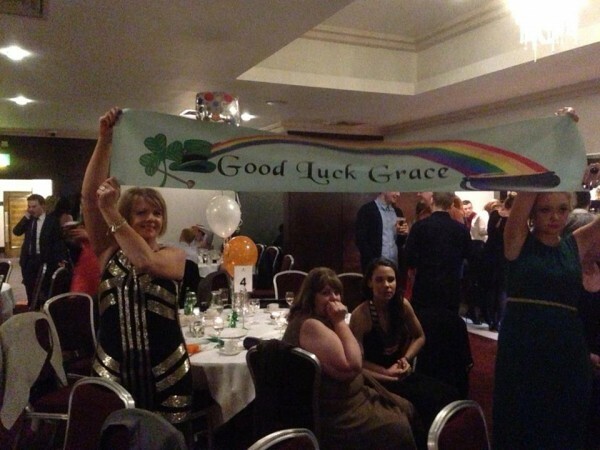 Grace was sponsored on the night by the Celtic and Irish Culture Society, organisers of the Crawley Irish Festival each August. CICS chairman John Nolan was also in the Crown Moran Hotel on Friday night to support Grace. Mr Nolan is also involved in the Carlow Association in London so there was a double reason to celebrate given Grace’s Tullow heritage. It was the first time that CICS entered the London heat. Grace will now go forward to the Rose of Tralee Regional finals in Portlaoise in late May and early June. She follows in the footsteps of outgoing London Rose Nora Ni Fhlannagain who was on hand to present Grace with her official London Rose sash. Another guest of honour was current Rose of Tralee, Nicola McEvoy from Luxembourg. This was Nicola’s only official London appearance as part of her year-long Rose of Tralee activities. She said: “It was fantastic evening and it is great to be back in London, I lived in Kent before I moved to Luxembourg. I want to congratulate Nora on being a fantastic London Rose and being a fantastic representative for the city. She has become a real good, lifelong friend and that is one of the beauties of the Rose of Tralee International Festival. I am eight months into my year as the International Rose and I have found myself in places I never imagined I would be in. My face is on milk cartons in Kerry, I have sang a song, in Bengali, in front of 2,000 children in Calcutta, I stood between Peter Robinson and Martin McGuiness in Stormont. My biggest highlight was travelling to America in March, participating in the New York St Patrick’s Day parade and travelling to Washington and standing in the East Wing of the White House and meeting President Obama. Grace's supporters in the crowd. The Kerry mayor Terry O’Brien travelled over to represent the county and the Rose of Tralee head office.